Featuring a Jack hat and a 3D felt appliqué bat bowtie, it's spookily cute. Includes long-sleeve bodysuit and hat. Hat features embroidered Jack face. 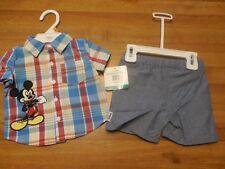 Disney Mickey Toddler Pants & Long Sleeve Shirt Set. Pluto & Mickey Picture With Sun & Trees. Cute & Comfortable ! Long White Sleeves. See Close Up Photo For Condition. Khaki Green Stripes On Legs. 100% Cotton. 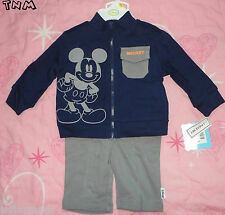 :-)**DISNEY BABY MICKEY MOUSE 3PC JACKET SET SIZE 3-6M***BRAND NEW!! Stretchy knit pants complete this adorable ensemble. Jacket: Mock collar. Chest flap pocket. Set: Jacket, T-shirt and pants. Zipper front closure. Size 3-6 months. Long sleeves. Dumbo embroidered on front. White, short sleeve shirt. The Item is like new in a very good condition. · Ribbed collar with faux fur (looks like a white beard). Mickey Mouse. · Set includes top, pants and coordinating Santa hat with embroidered details. Disney Baby. Fill a flat rate envelope or box for an even bigger savings! Baby Boys Disney Beauty and the Beast All in One with Hat. Condition is Used. Dispatched with Royal Mail 2nd Class. 2x new toy story Buzz light year romper ( baby grow ) for 0/3 month cute baby boy. Top -100%cotton, Dungarees 100%cotton. Two Piece Set Baby Boy Disney. It is a long sleeved over the head top with Mickey applique on the front and bottoms with an M on. The hood of the top has ears on. It is a lovely pair of bib shorts with a baby Tigger on the font and logo to 1 leg. It was bought but hardly worn so grab a bargain. Really cute sleep suit with embroidered Disney Bambi and butterfly. Baby pink plush velvet material. Size age 3-6 months.